Accept Credit Cards Anywhere!!! Increase Your Business. The #1 Resource For All Of Your Wireless & Portable Payment Processing Needs. Providing Superior Service To The Arts & Crafts Community For 25 Years. Free Equipment, Lease Financing & Short Term Rental Programs Available. Call for details or visit our website. Rings & Things is a wholesale supplier of jewelry-making supplies for professional craftspeople. You can find us on the Web at http://www.rings-things.com, or call us at 1 (800) 366-2156 for personal, friendly service. Toucan Art : Toucan Art oil paintings wholesale, Your online oil paintings supplier. Offers retailers and traders worldwide a large range of products! Easy online order procedure! Art Liquidation Oil Painting Reproductions Art Liquidation promotes oil painting works from starving artists specializing in Portrait and Old Master Reproductions. Contact us for your flyer and advertising needs, We can design your ad and publish it on our magazine. We can create a custom marketing bundle with printed media to suit your business. 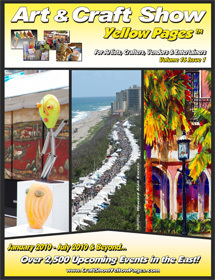 When you subscribe to Art & Craft Show Yellow Pages not only will you get 24/7 online access to our unique copyrighted data, but you can also request at any time a printed copy for an additional $15.00 dollars each print (Includes Priority S & H) as long as your subscription is current. Show Listings available for the states listed below. 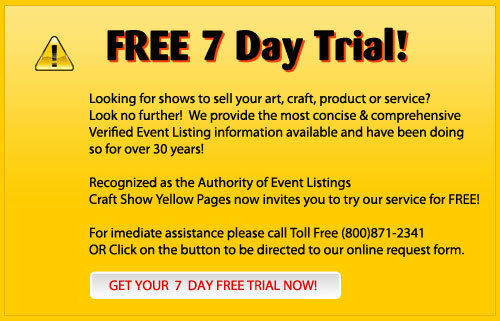 Free 7 Day Trial to Craft Show Yellow Pages or Craftmaster News!